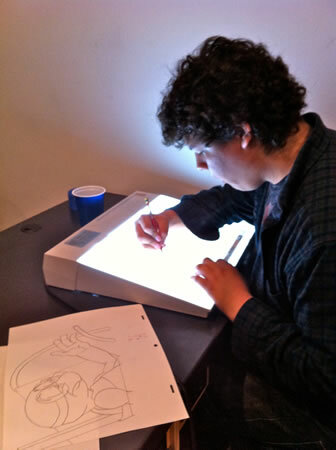 Warner High School students are assisted with their animation projects by LCAD seniors. As an administrative matter, the City Council unanimously approved the issuance of the loan from the California Enterprise Development Authority Tuesday following a public hearing required by the IRS. The art college already occupies one building and a portion of another building on the property, which are used for animation, digital media and game art classes as well as administrative space. Both buildings and a storage facility will be purchased for $10 million. The second building, now occupied by Winter Dental Laboratory, will undergo a complete redo beginning early next year, said Jonathan Burke, LCAD president, who set his sights on buying the property now leased by the college two years ago. The rest of the money will be used to refinance at a current lower interest rate existing mortgages on the administrative building and the senior students’ art studios across from the school’s main campus at 2222 Laguna Canyon Road, Burke said. 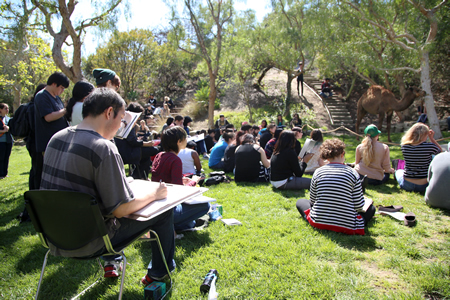 The private, nonprofit art school was first opened as Laguna Beach School of Art in 1961, then changed its name to the Art Institute of Southern California. In recent years, it took on the LCAD moniker. It continues to focus on the fine arts and now also specializes in digital arts, offering bachelor of arts degrees in five majors and masters of arts in two majors. The school currently enrolls 621 students and leases or owns multiple properties on both sides of Laguna Canyon Road. Tuition generated 93 percent of the college’s $14.8 million budget, which ran a $1.5 million surplus, according to the college’s most recent tax filing in 2013. Renovating the north campus will include adding two new classrooms, an equipment check-out room, new faculty office, animation work space and student lounge, Burke said. The original main campus houses most of the art studies classrooms, studios and student-services offices. Freshman dorms are located to the south, closer to town. Burke said the school has all the directions covered, “except north by northwest.” The north campus is expected to be ready for students by the fall semester, 2017, he said. The college is solely responsible for the repayment of the loan and no city assets were used as collateral, according to Gavin Curran, the city’s financial director. The college’s tax-exempt status reduces financing and debt-service costs, Curran noted. Winter Laboratory is moving to a larger space, a spokesperson said.